When playing blackjack in either a land based casino or as a live dealer game online, card counting can be a beneficial skill and can definitely help players gain an edge at the table. Blackjack camouflage is one of the most powerful weapons in the card counter’s arsenal. Camouflage means blending into one’s surroundings so as not to be noticeable. A polar bear blends into the white snow, as a deer blends into the forest. Likewise, the professional blackjack gambler wants to blend in among the amateurs. He wants to look like them and to speak like them and to act like them. He doesn’t mind winning more than they do, as long as he appears to be a lucky amateur and not a skilled professional. The professional blackjack gambler wants to look like a recreational gambler, talk like a recreational gambler, and act like a recreational gambler. Of course he wants to win more than a recreational gambler, but even then he wants to look like an amateur who got lucky and not like a professional using his skills. Until Uston’s book was published, team play was a good camouflage and, even afterward, it remained the best way to beat the system. A solo card counter is easy to spot and many a lone card counter has been ushered out of Vegas casinos. Card-counting teams have encountered great opposition over the years. Casino owners who fell prey to the teams’ wily camouflaging ways hired detective to flush out the counters and expose them. And all the while, these brilliant teams were winning at the blackjack tables, using super-sly methods to hide their techniques and their talents. The Griffin Book — a photo album featuring pictures of suspected card counters — put a damper on the success of these teams, but it didn’t stop them. There is simply too much money to be won at the blackjack tables and camouflaging — along with basic blackjack strategy and card counting — is the way to win it. Fortunately, when you play blackjack online, you are all alone with your computer. There are no pit bosses or security guards in the online blackjack casino. That means you can play online blackjack as you want to, with no one keeping an eye on you or trying to intimidate you. 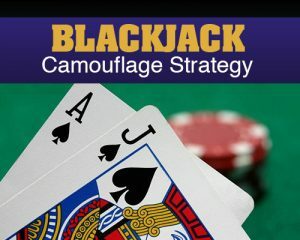 There is no rule against winning at blackjack in the online casino, and therefore no need to resort to camouflage. So relax and have fun playing and winning blackjack in the online casino.